The Wade family took over the running of The Exeter Arms in the Spring of 2016, a traditional pub set in the quintessential English village of Barrowden in the county of Rutland. Overlooking the village green and duck pond, it is considered one of the most picturesque Rutland villages, as it's set amongst the hills and rivers. Popular with walkers, as both the Rutland Round and Jurassic Way long-distance paths pass through the village. Those looking for solid sustenance should make their way to the low-beamed dining area, where head chef Aaron Squibb produces classic British dishes making excellent use of the local larder. Ale battered haddock is served with minted pea puree, hand cut double dipped chips and homemade tartare sauce or for meat fans there's low and slow cooked pork belly, seasonal vegetables and roasted potatoes. The pub still plays the part of a local watering hole serving the surrounding community and guests are made to feel very welcome, whether popping in for a relaxing drink or a three course meal. 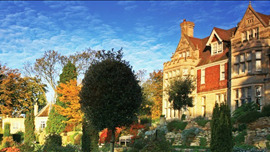 For many people, Hambleton Hall is the archetypal country house hotel and restaurant.